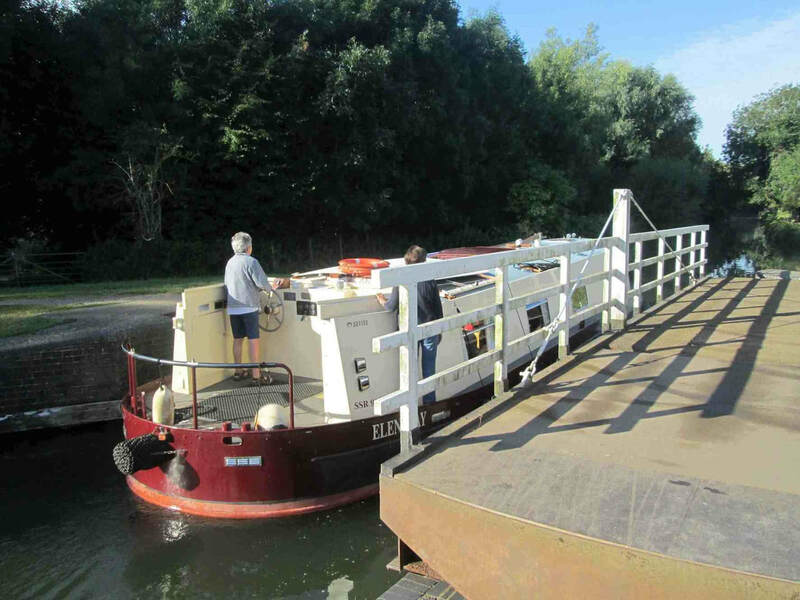 The Explorer Liveaboard Barge with “C” category coastal capability – 45ft x 12ft. 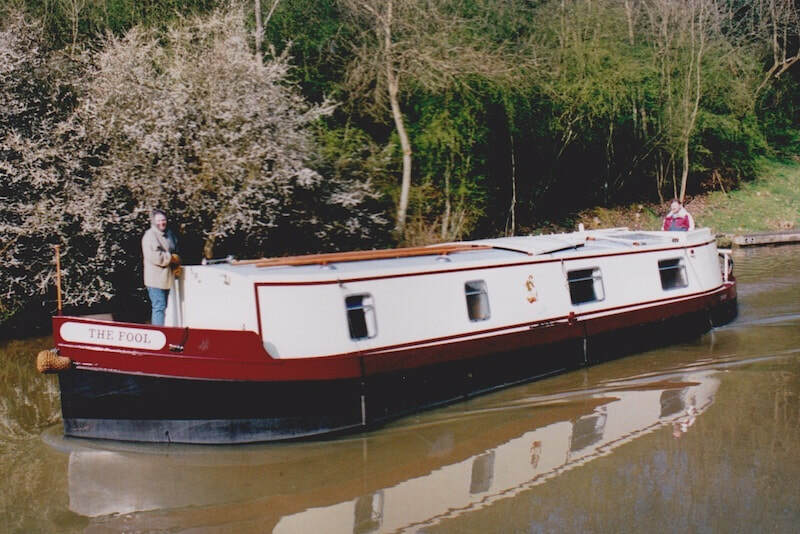 45ft Live aboard Steel barge originally built by us and now bought back from the owner, refurbished and ready to go. 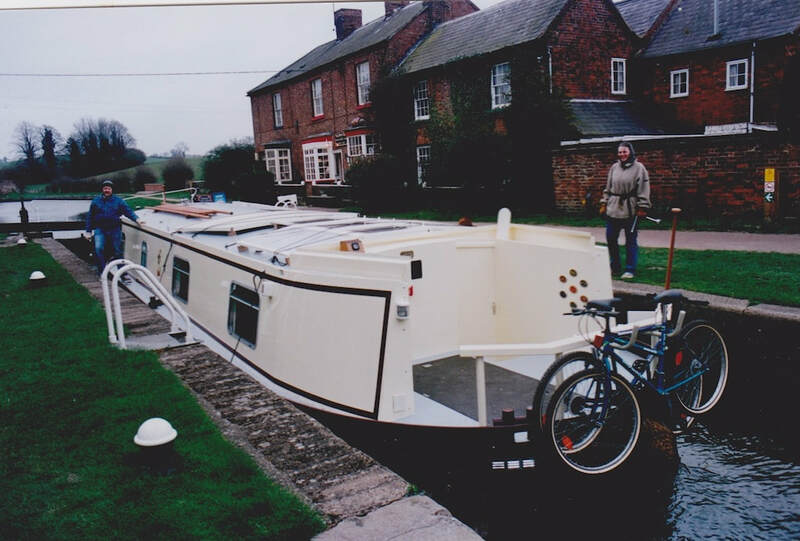 She has just been sold but we can build you a fresh one so please take a look and get back to us. A handy sized boat at 45 ft to 55ft, easy to handle and to moor with plenty of room. Slightly larger could qualify for VAT Zero Rating. A recent delivery trip by Peter Nicholls and then the new owners took place from Reading to Bath on the Kennet and Avon Canal. 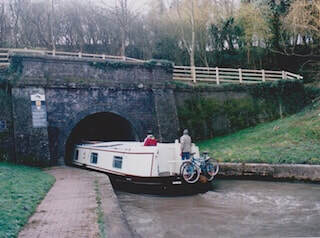 The K &A Canal is not the widest broad beam canal so special care has to be taken in designing a barge that will do the job comfortably She performed superbly and the journey from Reading to Bristol was easily done by a couple. 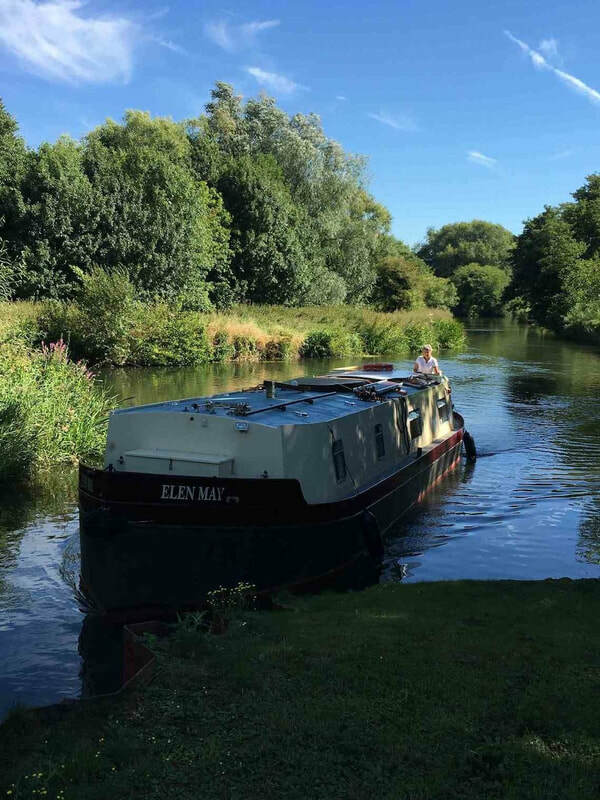 Yet with RCD category C certificate, a well-deigned hull and propulsion to match, is ready to put out into the Severn Estuary and to journey to Worcester m Evesham and Stratford upon Avon, A skipper’s log is available and will be posted soon. 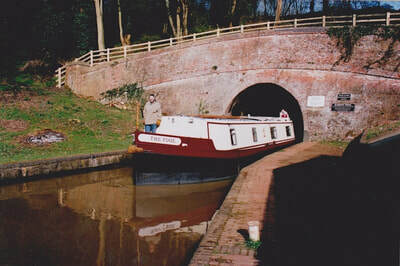 Berths for 2 plus 3. Making 5 in total. She can be seen out of the water at our works, with video footage available of a recent trip through France, Belgium and Holland for her to be trucked back to the UK. Further details of our Explorer range, including accommodation plan of this boat, can be found by clicking here. 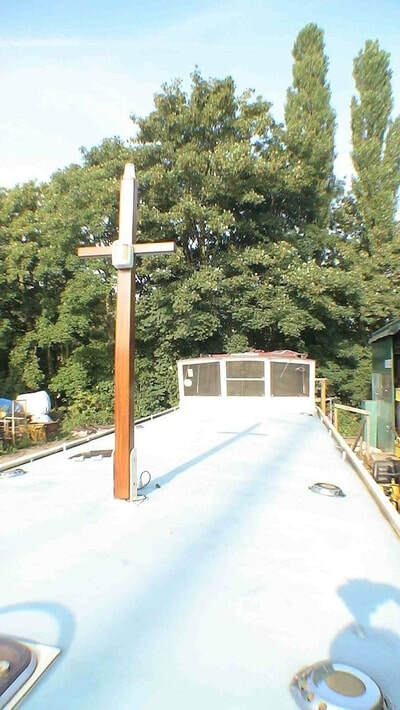 Residential moorings are available in London and elsewhere in UK and Europe. Or she can be delivered to France again to resume her travels there. 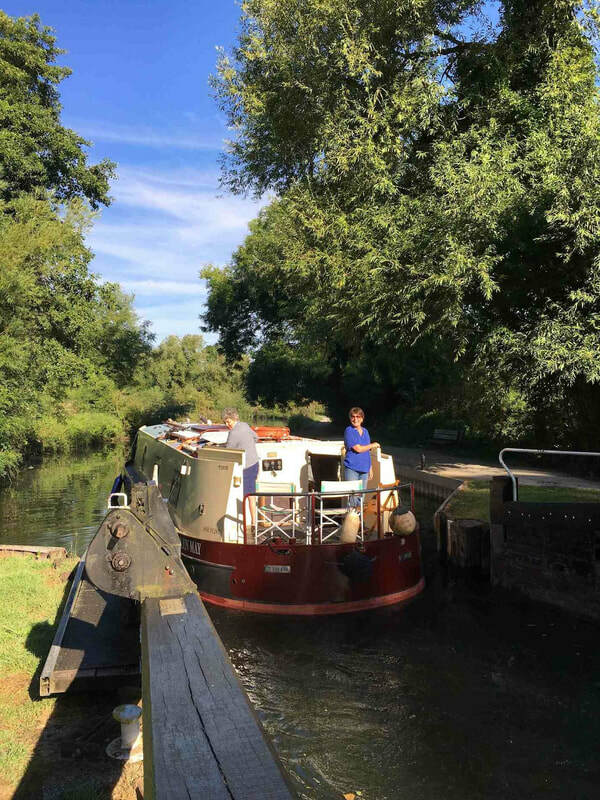 With wheelhouse removed she is also ideal to cruise UK wide beam waterways such as the Upper Grand Union Canal, Kennet and Avon, Rivers Thames, Seven and Trent etc. She has a new BSS Certificate and all VAT has been paid. 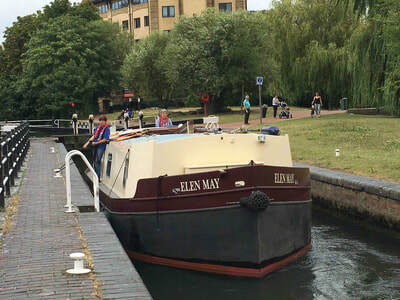 She was sold in August 2016, A fresh boat can be built, based on the design. ​Beta Marine 65 hp 5cyliner diesel with 2.5 reduction box. Stainless steel prop shaft ,recent AGM batteries for domestics and wet 12 volt battery engine start The engine room is in good order, clean and tidy with the original paintwork showing very little deterioration. The engine is easily accessed and there is ample storage in the engine compartment. 10mm plate base, 6mm hull sides & chine, 4mm cabin. Hull condition survey states that she is “in good structural condition” The hull was originally built by us in excess of The British Marine Federation Code of Practice for a wide beam pleasure craft. 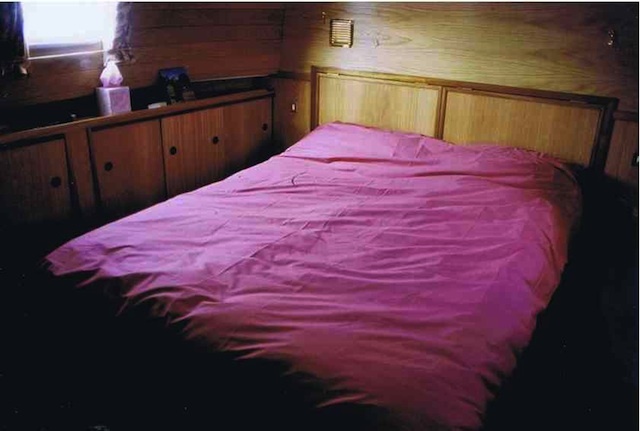 The cabin paintwork was in good order when we took her in. 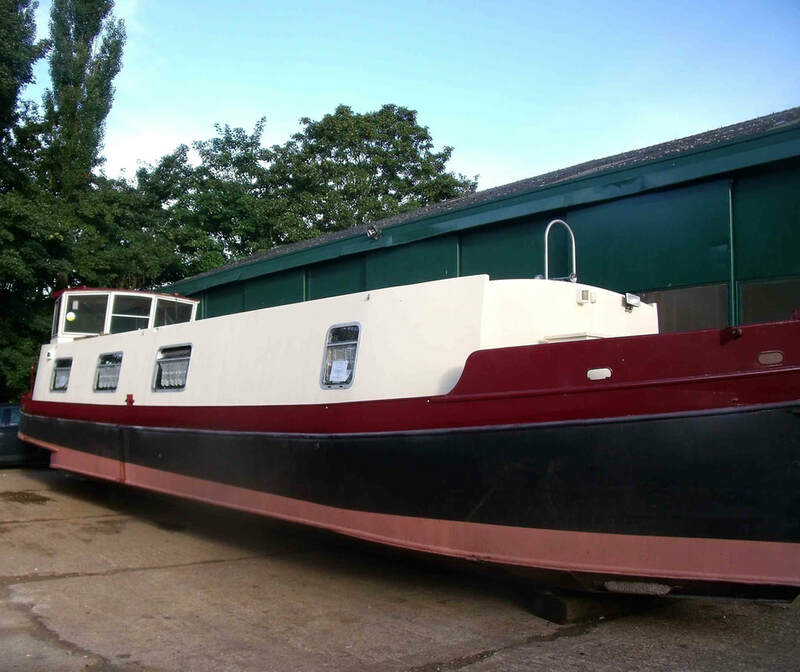 However we have further improved her with a full repaint in dry conditions in our workshop. Bow cabin with king sized interior sprung mattress with drawers under. 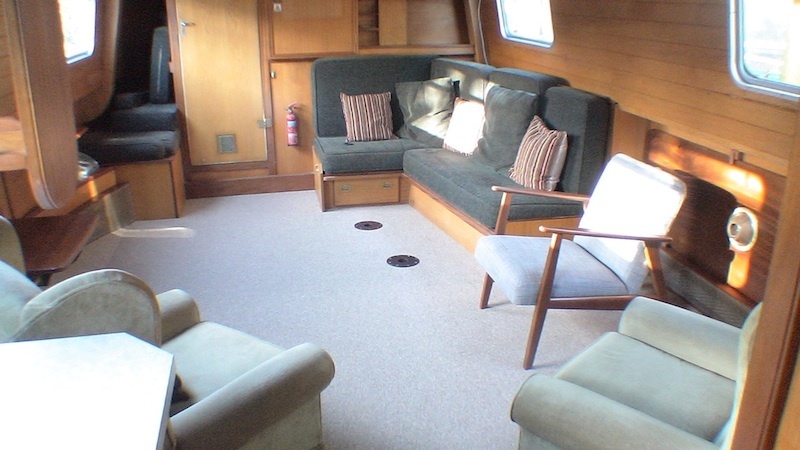 Port side shelves with cupboards beneath with sliding doors. 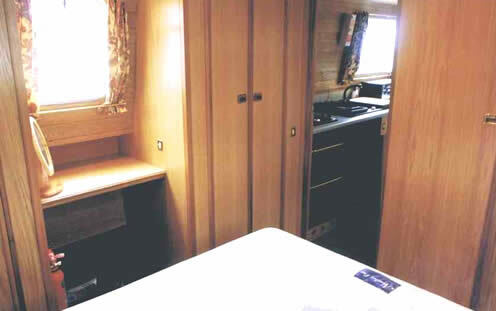 Starboard side two large, full height wardrobes with dressing table and drawers beneath. Roof lights and side lights and 12 volt and 240 volt sockets. 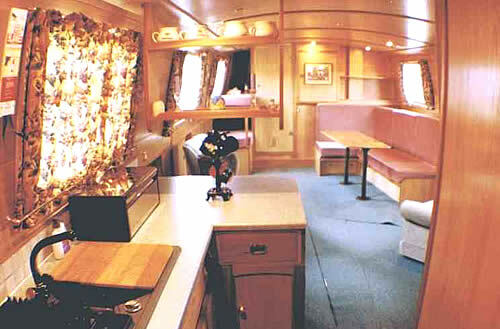 Door through to the galley with formica worktops, 4 calor gas burner hob with oven and grill, 12 volt refrigerator, cupboards and shelves and larder cupboard behind. 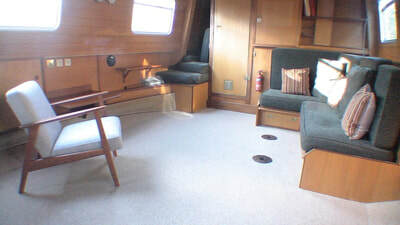 Large saloon with L shaped settee with converts to a double, drawers and storage under. Dining table. 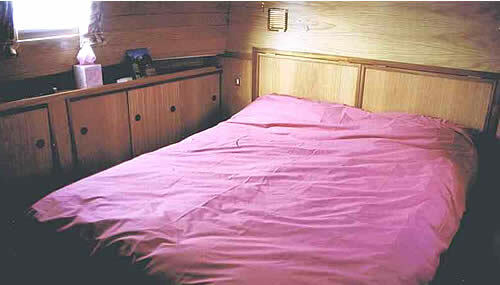 Extra single berth to starboard. 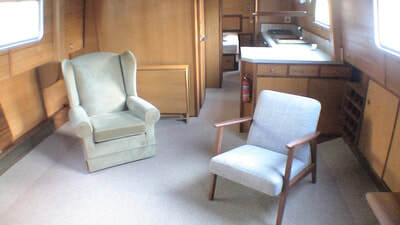 2 good sized domestic chairs the breakfast bar and stools seen have been replaced by further cupboards & worktop. Folding fixed coffee table. Built in cabinet, easily accessible with electric switches and circuit beakers. The original easy chairs are still in very good condition, but we have obtained some replacements as an option to change. Door out to . . . Heating by Webasto D5 diesel to radiators in each cabin and calorifier for hot water. 240 volt feed in from shore with Victron isolating transformer. 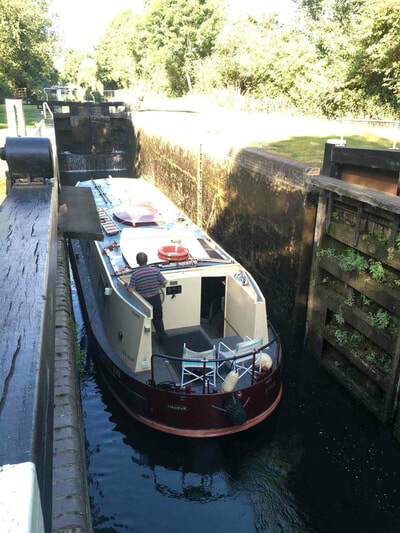 Victron battery charger and 300 and 100 watt inverter (can be uprated if required) Vetus 185mm bow thruster, with separate batteries to bow. Lofrans hand anchor winch and anchor to bow. 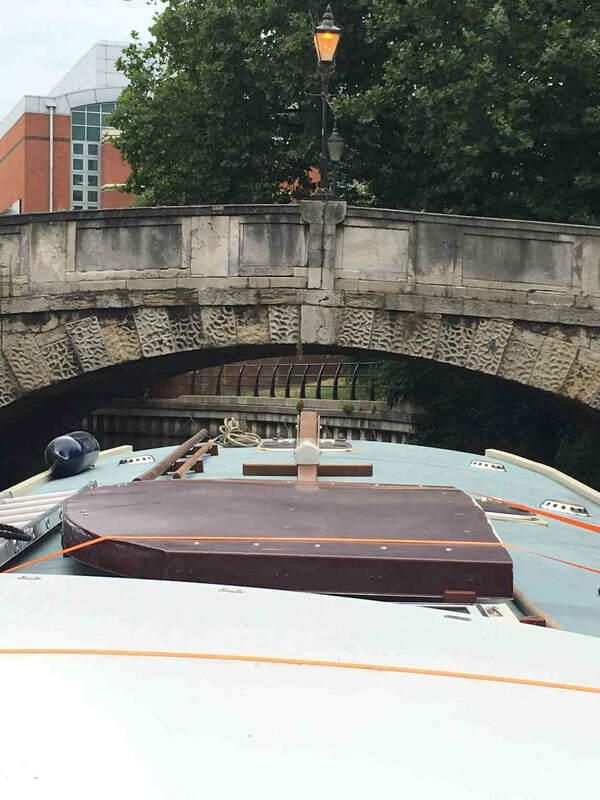 A video is available at our office of her cruising through France, on her way home.